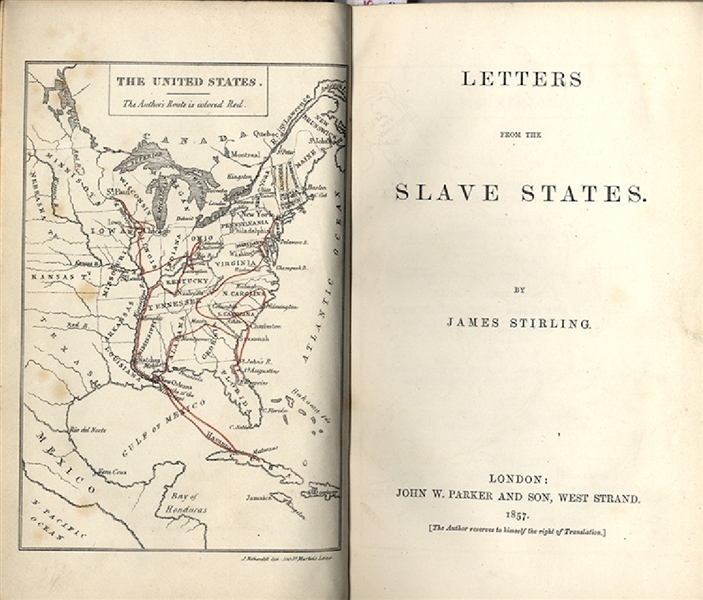 Book, “Letters from the Slave States” James Stirling, 1857, London, John W. Parker and Son, 1st ed. vii,374pp. map frontis., gilt covers, tight binding.VG. His commentary embraces thuggism in New Orleans, lynch-law, American police, pauper suffrage, the Seminole War, Florida squatters and Manifest Destiny, but the majority of his letters relate to his critical observations and opinions about slavery and the social structure of the South. He was convinced slavery would be abolished and the union preserved.